← Will Something Happen . . .? Dere har vel kanskje ikke hilst på våre 2 beste og mest trofaste venner innen familien? Her er de med på en tur i skogen, og som vanlig oppfører de seg helt upåklagelig. You have probably not had the pleasure of greeting two of our most loyal friends within the family? Here they are photographed during a trip to the woods – on their best behavour as usual! 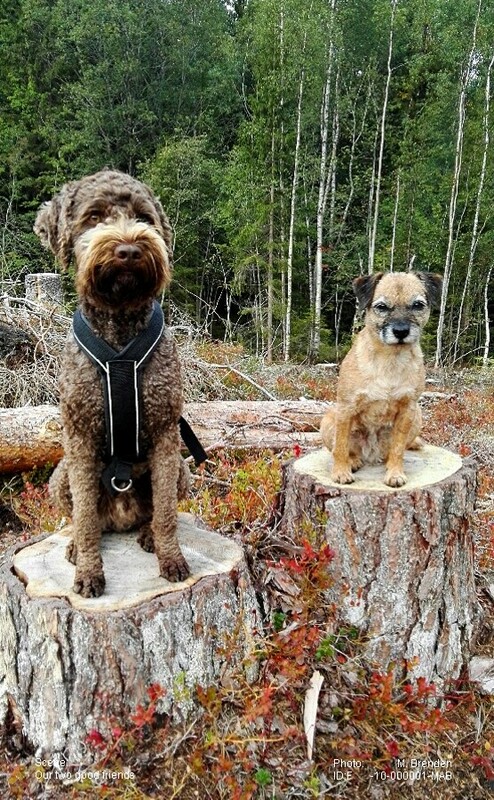 This entry was posted in BUSKERUD and tagged boarder terrier, foto, nature, Norge, Norway, Norwegen, photo, skogstur, vannhund, water dog, woods. Bookmark the permalink. Hahaha! How did you get them to pose?! Our Blue Heeler would be off in a flash! And his generic cattle dog companion would just try and have a lie-down. Sweet photo. Contact glue! I’m joking, of course! But they are both very well behaved. Dogs are the very best and most loyal friends you’ll ever have – treated right, that is. Oh wow.. I hope this introduction of these two lovelies is not the last Svein. Love them. Oh, I expect them to stick around for several years if they don’t poke their noses in places where they shouldn’t . . .
Like disturbing a sunbathing wiper! What handsome little friends you have. They are indeed, Missy, and very good friends at that! Not mine! Belonging to our daughter, however, we are ‘babysitters’ from time to time . . .
Oh, they’re so cute. I bet they’re fun to have around. She sure is! Do you know the breed, David? We have the very best of experiences with her, but the other guy seems to be turning out rather well. An extreme type of ‘family dog’! thank you for sharing, they are precious!!!! They are, indeed! It used to be 3, but unfortunately one curious little guy found a wiper. That didn’t turn out so well!